Jared Kushner and Ivanka Trump enjoy an extraordinary degree of power. Since taking to the stage in Donald Trump’s 2016 presidential campaign, the glamorous alpha couple of American politics have raised eyebrows with their dizzying ascent, sparking allegations of nepotism and corruption in the Trump empire. Now closely involved in the day-to-day running of the White House, they seek to present themselves as the voices of reason restraining the impulsive President from his worst excesses. In Kushner, Inc., bestselling investigative journalist Vicky Ward looks behind that diplomatic façade and suggests that their approach is more similar to Trump’s than it first appears. Like him, they are disdainful of rules, laws and ethics. Like him, they are driven by ignorance, arrogance and an insatiable lust for power. And, crucially, like him, they pursue a personal agenda that will have profound consequences for American democracy. 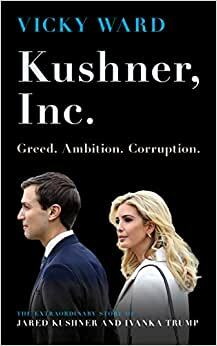 In this gripping exposé, Ward charts Jared and Ivanka’s journey from the Ivy League through big business into powerful positions in the White House, exploring the dark secrets that lie behind the ties of family loyalty. From perceived conflicts of interest to misuse of personal email accounts and unexplained meetings with Russian officials, this riveting portrait cuts to the heart of two of the most influential figures in US politics today. Vicky Ward is a New York Times bestselling author, investigative reporter and magazine columnist. The author of the bestselling books The Liar's Ball: The Extraordinary Saga of How One Building Broke the World's Toughest Tycoons (Wiley) and The Devil's Casino: Friendship, Betrayal and the High Stakes Games Played Inside Lehman Brothers (Wiley), she is currently the editor-at-large at HuffPost and HuffPost's long-form magazine, Highline, as well as at Town & Country magazine. Previously, she was a contributing editor to Vanity Fair for eleven years, where she covered politics, finance, art and culture. 5.0 out of 5 starsPerfect Timing. Can We Survive This? I purchased this book as an Audible book and what I took from this well investigated piece of journalism is that Ms. Ward really was able to get into the psyche of this couple pretending to be something they're not. Kushner Inc. The couple known as Javanka. As Ivanka's father does things more out in the open, the Javanka duo flies under the radar wreaking havoc with our systems of checks and balances that have been in place for more than two centuries. The damages, the secret dealings, etc... Javanka may have been able to unsettle the "norms" that we have built with blood sweat and tears all in the name of the selfish almighty dollar. If you thought Kushner Inc.'s 666 Park Avenue was a boondoggle, we may all hopefully (thank you Robert Mueller et alia.) find out that we have all just been flimflammed like nothing before. 5.0 out of 5 starsInsight into the most dangerous couple in America. To paraphrase the author, on the dangerous scale, Jared & Ivanka are #1 & #2 with Donald Trump, as terrible as he is, coming in at #3. Imagine that. While Donald Trump is acting out, getting all of the attention, these two are like sharks below the surface, making policy in the Middle East in order to make the Saudi's happy and being paid personally & handsomely for that policy". It's like Donald Trump is running cover for Jared & Ivanka. The biggest question remains. How much longer is the Republican Party going to allow this kind of nepotism and corruption to continue? 228 people found this helpful. Corruption with a CAPITAL C......The book is remarkable, Mr and Mrs Pretty Boy....running our Country, their way......the corrupt way with lies, and greed...to gain everything they can at any cost to the American people and the Country. ..It's all about them, and let me tell you ...Clorox can't produce enough to clean out the filth they will leave behind....Thanks for the book of honesty and a partial picture of a Very Corrupt, Self Serving Family. 209 people found this helpful. 5.0 out of 5 starsJuicy! So far the only other review is someone who gave it one star because they personally don’t like Kushner. Well, if you don’t like Kushner, you’re going to love this book. It’s very juicy and full of interesting details. Like the fact that Jared‘s father, Charles Kushner, used to visit New York City under a fake name to have relations with men. 205 people found this helpful. Inside the Kushner pompousness. Vicky did a great job showing how dangerous these two ignorant no nothing people are ruining our democracy. A must read.